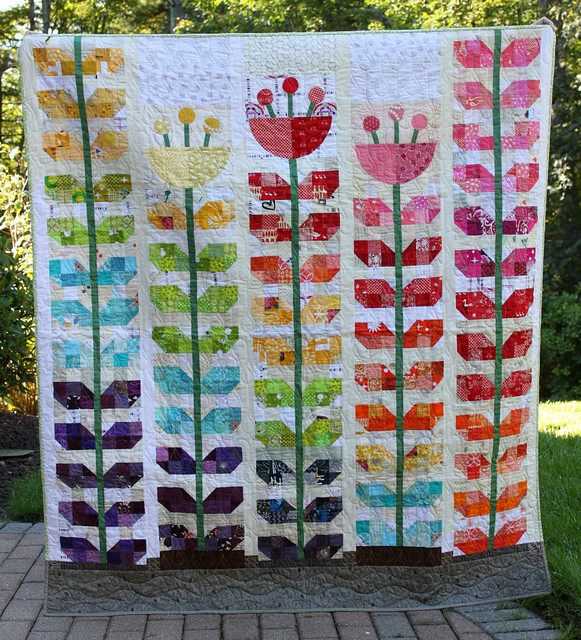 We are happy to reveal a finished charity project: Cutting Garden, designed by Krista Hennebury of poppyprint. This quilt was a group effort! Guild members sewed the leaves, and the top was pieced at one of our Peabody Mill bees. Lorri Wurtzler, of Seventh Heaven Quilting, quilted this project. A special thanks goes out to bee-goers Brianna, Pat, Nancy, and Carolanne for their piecing expertise; to Susie for binding this project; and to Michelle and Betsy, charity cochairs, for organizing everything. This quilt will be raffled off at the church’s upcoming Olde-Fashioned Country Fair, on October 20th and 21st. This quilt is adorable! The colors are very cheerful and it was a very generous gift. I am sure they will do well with the raffle. A beautiful finish!! Best of luck on the raffle. Lovely finish. I have not seen this pattern before and now want to go dig through my scraps to create one. Do you offer this pattern? I would love to make one for a charity group as well. We used old plastic bottles and we also painted our old pot to make it new.pool vacuum You don’t need to spend a lot of money just to have an ideal garden, all you need is your creativity.